The third feature length film from British director Saul Dibb (Bullet Boy – a look into South East London gang culture in the noughties – and The Duchess, a period drama starring Keira Knightley and Ralph Fiennes), Suite Française feels like a natural evolution from The Duchess. With fantastic cinematography, beautiful settings and incredible production design combined with the thoroughly enjoyable performances from not just the leads but the supporting cast, Suite Française is a fantastic addition to anyone’s collection and a must-see for fans of the original novel. Co-written by Matt Charman and based on the novels of Irene Nemirovsky, the story of how these novels came to be feeds into the magnificence of the film. A series of 5 books was meant to be written but she only completed two because she was arrested as a Jew and sent to Auschwitz in July 1942. The novels were then found, reconstructed and published by her daughters in 2004 to critical acclaim. 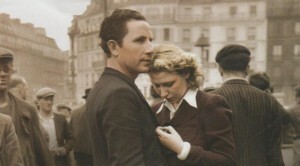 The combination of storylines from the two novels, Storm in June and Dolce, with the story of Parisian exodus and rural melodrama creates a compact and filmic narrative. Charman, known for his theatre background but also screenwriter for the upcoming Steven Spielberg spy drama, Bridge of Spies, starring Tom Hanks, is fantastic at adapting the novels into a well-rounded story that follows conventions of the “sleeping with the enemy” scenario while adding twists and turns that make it feel new and refreshing. The romantic World War II drama centres on a romance between a French villager, Lucille Angelier, played by Michelle Williams and a German officer, Bruno von Falk, played by Matthias Schoenaerts, during the early years of the German occupation of France in a small town called Bussy. This period of time focuses on the refugees from Paris and soldiers from Berlin settling in a town that is quiet and not known for any type of trouble. Filmed at locations in France and Belgium, the surroundings capture this time period tremendously and add depth, texture and history to facilitate the acting and story arcs. Shot entirely on 35mm by cinematographer Eduard Grau, this creates a look and feel that is perfect for the period and great for this genre of cinema. Along with Oscar-nominated Michael Carlin’s production design, this makes Suite Française one of the most beautiful looking pictures of the year so far, basing it in reality and grounded nature. Performances from Kristin Scott Thomas, playing Lucille’s mother-in-law and Sam Riley, playing a French soldier, book-end a strong cast of players who each bring their own to the role, with Williams always bringing the strong game seen throughout her career. But easily the best acting is by Harriet Walter and Lambert Wilson, and it will be interesting to see what happens next for those actors, out-performing the likes of Williams and Schoenaerts. A fantastic film released in the summer blockbuster and raunchy teen comedy season, this is a surprising delight for a more mature audience. Five featurettes are included in both DVD and Blu-Ray releases of the film, which provide an in-depth, behind the scenes look into the making of the film. Suite Française is out now on DVD and Blu-ray.